The little one, like most boys, love all things fireman, policeman etc. I happened to find out by chance that every Saturday morning, from 9-11am, most of the fire stations in Singapore are opened to visitors! The moment I was told me about the open house, I made plans to bring the little boy to one of the fire stations. As I was going to be busy for the next couple of Saturdays, I had to rely on the hubby for this little field trip. I managed to convince him into bringing the little one on the day that the elder sister was away for a sleepover. And so, off they went early last Saturday morning. The little one even had his fireman costume/jacket on for the trip! He had wanted to bring his siren and fire extinguisher as well but we convinced him not to. They arrived at about 9:30am and there was a small group of visitors being shown around. A very kind fireman came over to hubby and son and offered to bring them around. 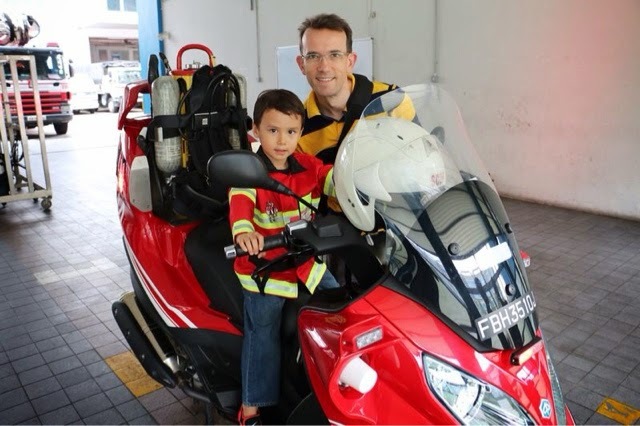 The tour started with a show of the different types of vehicles that the Singapore Civil Defence Force (SCDF) uses for fire fighting. The fire engine! 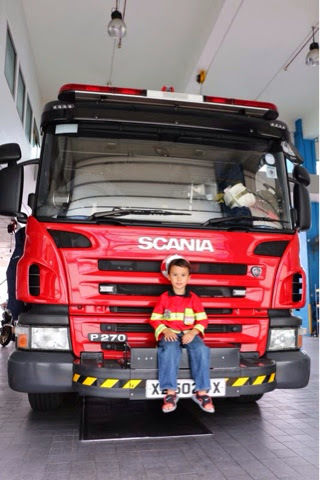 The boy looking smart with his Melissa and Doug Fireman costume sitting on the front of the truck. The boy going into the fire engine truck and even onto the driver's seat after. He was very excited to check out the fireman's accessories and equipment in the truck. Next up is the Fire Bike. After the tour of the vehicles, the boy got a demonstration of how to use the hose for putting out fires. He was even given a chance to try it out. I understood from hubby that he was the only one during that time who had the chance to use the water hose. Just look at how proud he looks! The little fireman told me that the hose was really heavy and it was not easy maneuvering it. 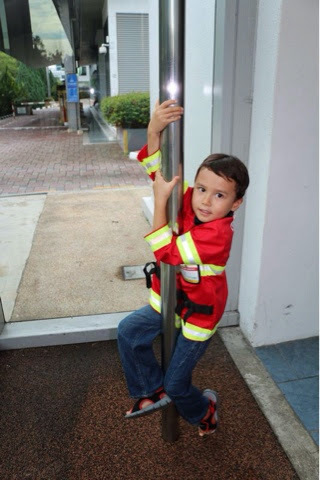 After that, the firemen also demonstrated how to get down the fireman's pole. The boy was eager to try that but it would have been a tad too difficult for him. Nonetheless, hubby let him checked it out by carrying him higher up the pole and letting him slide down. It was definitely not from the second story of the building! And finally, after about 45-60mins, the tour has ended and here is an obligatory photo of the boy and the real firemen! 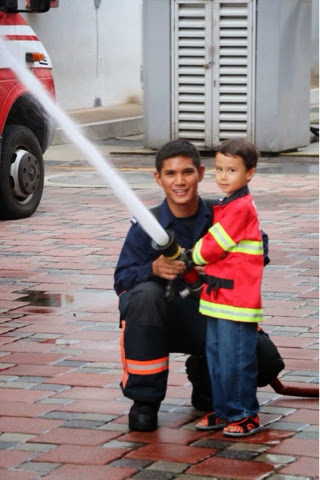 The boy very seriously told me that he was invited to "work" with the firemen to put out fire with them since now, he knows how to use the equipment and could go on the fire trucks. 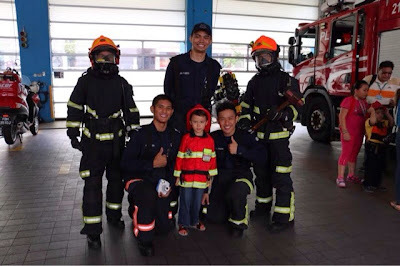 A big thank you to the very friendly fire fighters who kindly made my son's day that Saturday morning! I understand that the Central Fire Station is very popular however, if you would like more personalised attention, I believe the smaller stations would provide a more intimate setting. 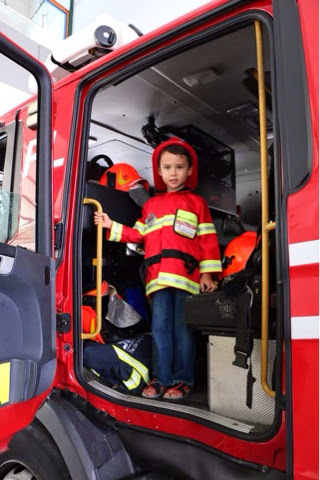 In our case, the boy was attended to by one of the firemen who literally took him by the hand around the station, patiently explaining each and every feature of the tour. If you have a free Saturday morning, I definitely recommend checking out the Fire Station Open House. It's fun and it's free.